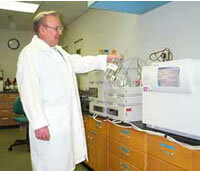 A USGS scientist uses liquid chromatography and mass spectrometry to measure antibiotics in waste water from around the U.S. Recent advances in laboratory methodologies made by U.S. Geological Survey (USGS) Toxics Hydrology Program scientists are providing improved capabilities for detecting large numbers of new and potentially harmful contaminants in our water resources at very low levels. There are many thousands of chemicals (including pesticides, human and veterinary medicines, personal care products, and other organic compounds) that enter our water resources by accidental spills, runoff from land applications, conventional waste-management practices and other mechanisms. Many of these compounds are known or suspected to have ecological or human health effects at very low concentrations. Development of capabilities to detect low concentrations in aquatic environments is important for several reasons: 1) many compounds are used in relatively small quantities and therefore concentrations in the environment are low; 2) many degrade or are transformed to other compounds, thereby reducing environmental concentrations; 3) compounds can partition among various environmental media such as soil or sediment particles; 4) the complex mix of natural and manufactured chemicals found in environmental waters can mask the detection of contaminants of concern, and 5) some classes of contaminants may have ecological health effects at low levels. The processes that affect the transport, persistence, and fate of the compounds in the environment. Toxics Program scientists have developed eight new methods during the past year that provide improved measurement capability for many tens of contaminants, including methyl mercury, surfactants, pesticides, and pharmaceuticals. Analytical method development is a continuing research topic for Toxics Program scientists. Babiarz, C.L., Hurley, J.P., Krabbenhoft, D.P., Gilmour, C., and Branfireun, B.A., 2003, Application of ultrafiltration and stable isotopic amendments to field studies of mercury partitioning to filterable carbon in lake water and overland runoff: The Science of the Total Environment, v. 304, no. 1-3, p. 295-303, doi:10.1016/S0048-9697(02)00576-4. DeWild, J.F., Olson, M.L., and Olund, S.D., 2002, Determination of methyl mercury by aqueous phase ethylation, followed by gas chromatographic separation with cold vapor atomic fluorescence detection: U.S. Geological Survey Open-File Report 01-445, 14 p.
Ferrer, I., Furlong, E.T., and Thurman, E.M., 2003, Identification of homologue unknowns in wastewater by ion trap MSn--The diagnostic-ion approach, in Ferrer, I., and Thurman, E.M., eds., Liquid Chromatography/Mass Spectrometry MS/MS and Time-of-Flight MS-- Analysis of Emerging Contaminants (Orlando meeting): American Chemical Society ACS Symposium Series 850, p. 376-393. Ferrer, I., and Thurman, E.M., 2003, Analysis of emerging contaminants, in Ferrer, I., and Thurman, E.M., eds., Liquid Chromatography/Mass Spectrometry, MS/MS and Time of Flight MS--Analysis of Emerging Contaminants (Orlando meeting): American Chemical Society ACS Symposium Series 850, p. 2-13. Furlong, E.T., Ferrer, I., Gates, P.M., Cahill, J.D., and Thurman, E.M., 2003, Identification of labile polar organic contaminants by atmospheric-pressure ionization tandem mass spectrometry, in Ferrer, I., and Thurman, E.M., eds., Liquid Chromatography/Mass Spectrometry MS/MS and Time of Flight MS--Analysis of Emerging Contaminants (Orlando meeting): American Chemical Society ACS Symposium Series 850, p. 175-187. Lee, E.A., Strahan, A.P., and Thurman, E.M., 2002, Methods of analysis by the U.S. Geological Survey Organic Geochemistry Research Group - Determination of glyphosate, aminomethylphosphonic acid, and glufosinate in water using online solid-phase extraction and high-performance liquid chromatography/mass spectrometry: U.S. Geological Survey Open-File Report 01-454, 13 p.
Lee, E.A., Zimmerman, L.R., Bhullar, B.S., and Thurman, E.M., 2002, Linker-assisted immunoassay and liquid chromatography/mass spectrometry for the analysis of glyphosate: Analytical Chemistry, v. 74, no. 19, p. 4937-4943, doi:10.1021/ac020208y. Lee, E.A., Strahan, A.P., and Thurman, E.M., 2002, Methods of analysis by the U.S. Geological Survey Organic Geochemistry Research Group--Determination of triazine and phenylurea herbicides and their degradation products in water using solid-phase extraction and liquid chromatography/mass spectrometry: U.S. Geological Survey Open-File Report 02-436, 26 p.
Leenheer, J.A., Furlong, E.T., Ferrer, I., and Rostad, C.E., 2003, Charge characteristics and fragmentation of polycarboxylic acids by electrospray ionization/multistate tandem mass spectrometry (ESI/MS/MS), in Ferrer, I., and Thurman, E.M., eds., Liquid Chromatography/Mass Spectrometry, MS/MS and Time of Flight MS--Analysis of Emerging Contaminants (Orlando meeting): American Chemical Society ACS Symposium Series 850, p. 312-324. Thurman, E.M., and Ferrer, I., 2003, Comparison of quadrupole-time-of-flight, triple quadrupole, and ion-trap mass spectrometry/mass spectrometry for the analysis of emerging contaminants, in Thurman, E.M., and Ferrer, I., eds., Liquid Chromatography/Mass Spectrometry/ MS/MS and Time of Flight MS--Analysis of Emerging Contaminants (Orlando, Fla. meeting): American Chemical Society ACS Symposium Series 850, p. 14-31. Thurman, E.M., Ferrer, I., and Furlong, E.T., 2003, Time-of-flight/mass spectrometry and quadrupole ion trap MS/MS for the discovery of herbicide degradates in groundwater, in Ferrer, I., and Thurman, E.M., eds., Liquid Chromatrography/Mass Spectrometry, MS/MS and Time of Flight MS--Analysis of Emerging Contaminants (Orlando meeting): American Chemical Society ACS Symposium Series 850, p. 128-144. Zimmerman, L.R., Schneider, R.J., and Thurman, E.M., 2002, Analysis and detection of the herbicides dimethenamid and flufenacet and their sulfonic and oxanilic acid degradates in natural water: Journal of Agricultural and Food Chemistry, v. 50, no. 5, p. 1045-1052, doi:10.1021/jf010779b. Zimmerman, L.R., Ziegler, A.C., and Thurman, E.M., 2002, Method of analysis and quality-assurance practices by U.S. Geological Survey Organic Geochemistry Research Group--Determination of geosmin and methylisoborneol in water using solid-phase microextraction and gas chromatography/mass spectrometry: U.S. Geological Survey Open-File Report 02-337, 12 p.